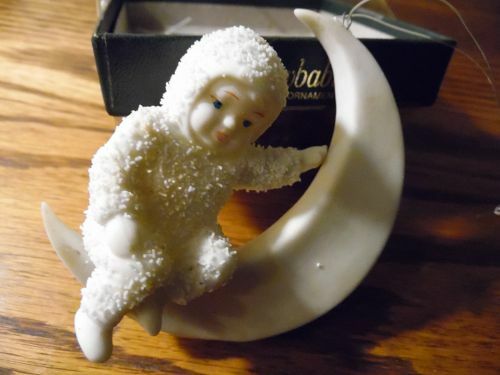 Sweet Snowbabies Moon Beams Christmas Ornament made of Porcelain. Dept 56. Adorable and in perfect condition. Comes in the box. Used but kept clean and perfect. Beautiful Wedgewood Christmas Angel holding a star ornament. Jasperware blue and white. NEVER used. All original packaging in the box. Simply beautiful. 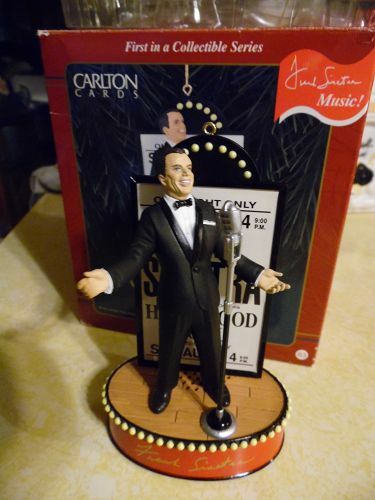 Carlton Cards "Ol' Blue Eyes" Frank Sinatra 1999 Ornament Plays Christmas Waltz.Works well.Original box. Box has crease on the lid. All original packaging. In excellent pre-owned condition. 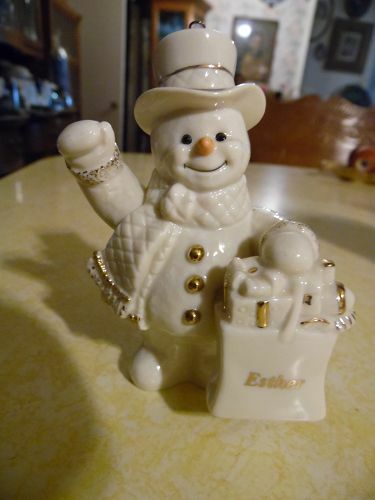 Lenox Fine Porcelain snowman Personalized Snowman Christmas Ornament "Esther" 4" Tall Excellent condition, like new. 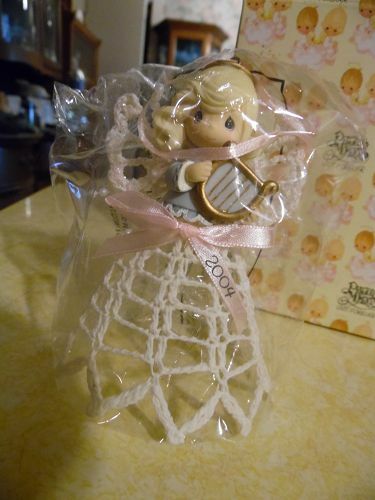 Avon Precious Moments Enesco, Ornament "Girl/Harp 113639 Crochet bell hanging Ornament is dated 2004 Condition Is Mint in original box and packaging. 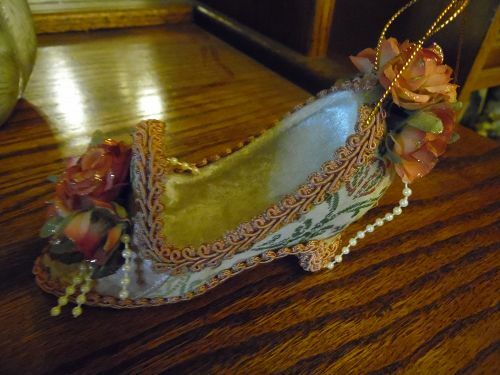 Pretty ornament is a fabric covered shoe with a Victorian flair. Brocade, lace, pearls,ribbon,velvets and fancy braid. Wonderful condition. I have another that is similar and just as cute if interested. 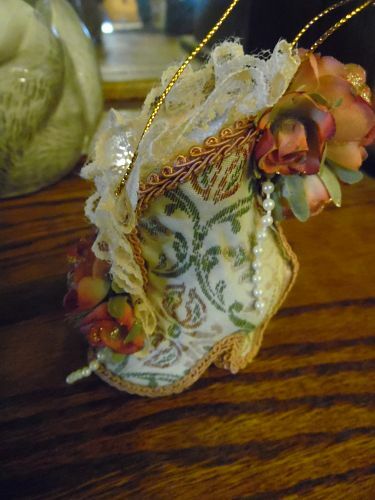 Pretty ornament is a fabric covered shoe with a Victorian flair. Brocade, lace, pearls,ribbon,velvets and fancy braid. Measures 4" tall and is in wonderful condition. I have another that is similar and just as cute if interested. I can send a photo if you like. 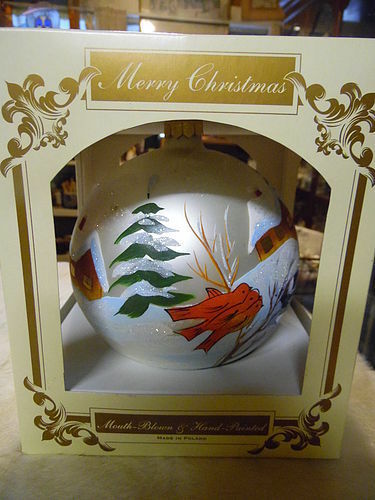 Waterford Holiday Heirlooms New Years Celebration Glass Ball Ornament 2000/2001. Large size in original box with paperwork. Box is really rough but ornament is pristine with original hang tag and ribbon. Made in Italy. ORnament marked Waterford also. One (1) Blown Glass Christmas Ball by Impuls, Poland. Gorgeous Mouth Blown & Hand Painted with a snowy winter scene, and houses and red cardinals. 6" Round Ball (18" circumference). Its huge.Excellent Condition - Ornament has no chips, cracks or scratches and has never been out of the box. It is gorgeous!! 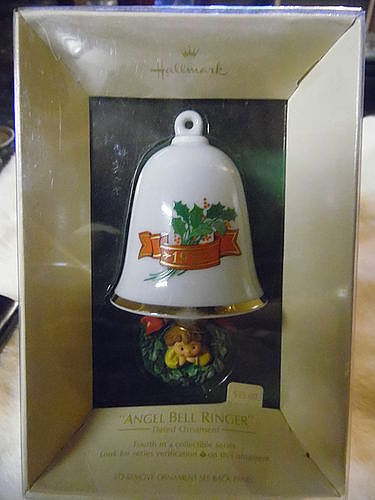 Hallmark 1982 Bell Ringer 4th in Series Angel bell Ornament.This Hallmark Keepsake is mint, in it’s original box with price tag. 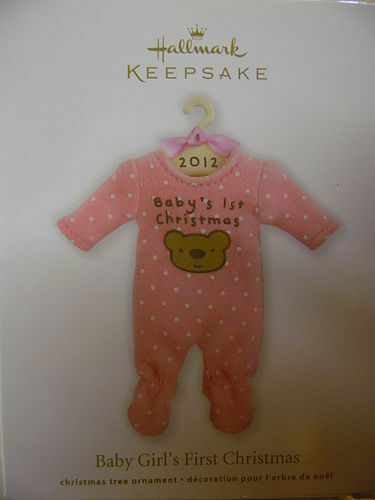 Baby's 1st Christmas 2012 Hallmark Keepsake Ornament. Remember the year you were blessed with your sweet addition—and all those tiny clothes—with this soft pink knit onesie ornament. Original box. Never opened, Mint box too. 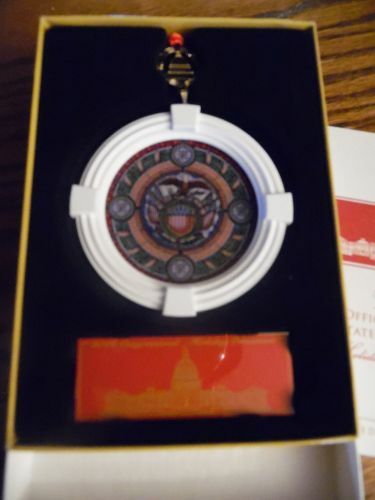 You are bidding on a vintage Hallmark ornament. 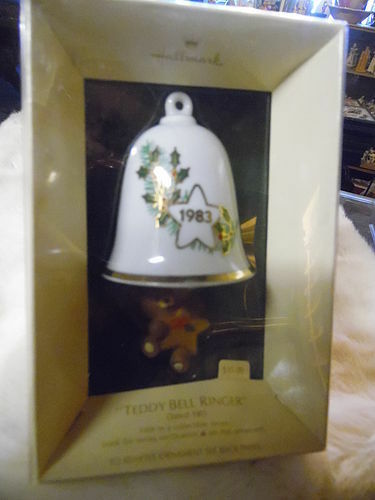 This is a 1984 ELFIN ARTIST, #6 and final in the Collectible Ceramic Bell series. 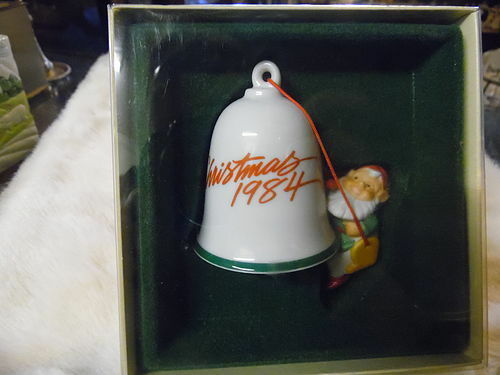 The ornament is mint, the box itself is nice, the front plastic cover has a tear and has some yellowing to it. Original price tab still attached. QX1479 - Rare Hallmark Keepsake Ornament MINT IN BOX. Bellringer Series First in Series - Elf. Made of Porcelain and Handcrafted. 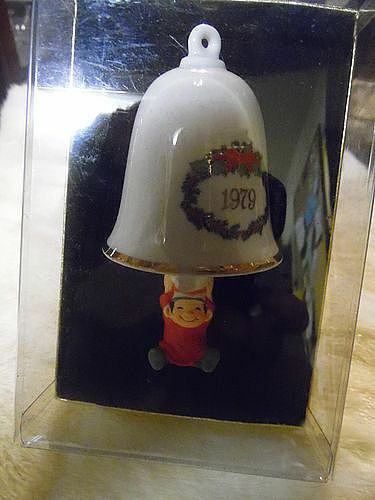 Dated 1979 A happy elf swings on the clapper of a white porcelain bell decorated with a wreath. 4" Tall, Artist: Sue Tagu. Mint in original box. Hallmark 1980 The Bellringers, Second in the Series! Tree Trimmer Collection Keepsake Ornament. 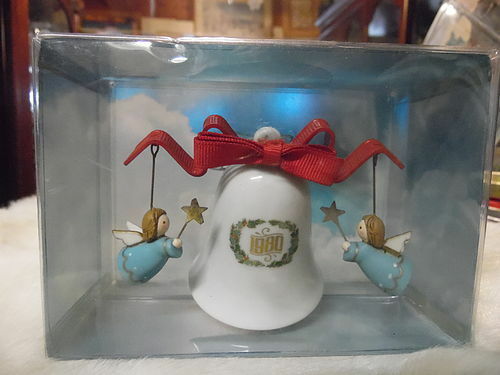 Dated porcelain bell with 2 angels bell ringers suspended from the bow.Ornament is in mint condition. Comes in original box. Here's your chance to own this very lovely, and RARE Christmas ornament! 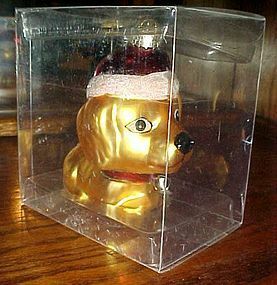 Cute blown glass ornament is a golden puppy wearing a Santa Hat with glittery accents on collar and fur trim. Nice large size, measuring about 4 1/2" tall and over 4" long. Still in original plastic packaging.